"Goldilocks and the three bears" is a family-friendly variation of an old tale in which a woman enter the house of three bears, eats their food, sits on their chair, and sleeps in their bed. This very old nursery tale is one of the most popular stories in the English language. It suggests the importance of respecting property and the consequences of just 'trying out' things that do not belong to you. As such, it will spark important interrogations from children: was Goldilocks right to come into the house? Were the bears really scary, or just helpless victims? What would have been the best thing to do? 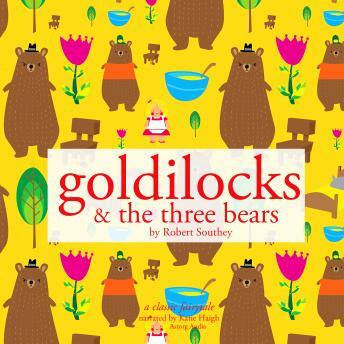 The story of Goldilocks will inspire children, teach them valuable lessons, ignite their imagination and help them develop in an insightful and healthy way. Enjoy the warm and lively narration on this audiobook, while you share with your children this essential part of our culture.